Trim off top 1/2-inch tomato and remove core. Scoop out 1/2 of the flesh to make a "bowl". Discard seeds, dice remaining flesh and reserve. Season interior of tomato shell with kosher salt and freshly ground pepper. Whisk together olive oil and vinegar. Combine with cottage cheese, cucumbers, reserved tomato flesh and one tablespoon of the chives. Season to taste with kosher salt and freshly ground pepper. 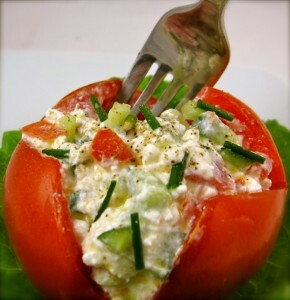 Stuff cottage cheese into tomato shells and serve.